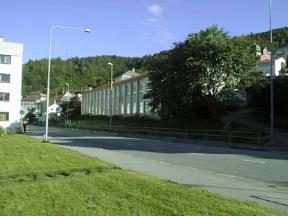 * From 1977 to 1983 my primary school was Holen skole in Laksevaag. (Now a part of Bergen). Back then, I was not fully aware of the tragic history to my school. Everybody knew that the school was hit by bombs during the war, but it was seldom discussed by us kids. There where few adults to tell us the terrible story. The only reminder was a plaque hanging in the hallway in the school that was boring for us kids to read, we did not realize the terror this school went trough during the war. * I will try to describe the events that led to this, and several other failed bomraids at Laksevaag during 1944-45. During the last months of 1939, and the first ones in 1940, the German submarines attacked allied ships, mainly in the Atlantic ocean. The range of the German submarines was limited, and they had no ability to attack the very important allied convoys to Murmansk in Russia. In addition to the u-boat bases in France and Biscaya, the Germans needed bases in Norway to be able to really hurt the allies. After the invasion in Norway, it was decided to build u-boat bases in Tronheim and Bergen. In may 1942 started the construction of the u-boat bunker in Bergen. It contained 7 pens, and had a 6 meter thick roof, and the walls was 2,5 to 4 meters thick. The u-boat bunker was planned to be completed in July 1945. 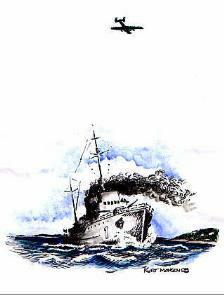 The 11.Unterseebootsflottille was formed in mid-42 and was stationed in Bergen. By the end of the war, they had been assigned over 190 u-boats of VII, XXI and XXIII type. When the Germans withdrew from France in 1944, the u-boats was transferred to Norway, and caused a big treat to the allied convoys in the North sea. The RAF was, because of this, very eager to bomb the u-boat bunkers. The bomb raid on the bunker in 1944 was to become one of biggest tragedies in Norway during WW2. It was early morning 09:05, 4.october 1944, when the first planes was observed. They came in from the west and turned north over the city, when they suddenly dropped their bombs. The target was the u-boat bunker, but the bombs hit everywhere, and it seemed like the RAF was carpet bombing the whole of Laksevåg. One of the bombs hit Holen skole, crashing through the roof and exploded over the air-raid shelter that was housing 350 children, teachers and men from the civil airdefence. The rescue teams and firefighters that found the dead children said that at the instant of death, some of the children had clung to their teachers and was now nearly impossible to remove. Others died under collapsing walls, and of suffocation. It is impossible to imagine the dreadful seconds in the shelter, when the lights went out, and the panic started among the children. 61 children, 2 teachers and 16 men from the civilian airdefence died on Holen Skole that day. A total of 193 Norwegian civilians died as a result of the bomb raid, 180 was wounded, 60 houses was totally destroyed and over 700 people was homeless. The Germans lost 12 men,2 u-boats (damaged or destroyed: U-228 and U-993) and at least one auxiliary boat (E. Bornhofen). It is believed that a few russian POW's working on the bunker was killed too, but this is not in any record and remains unknown. The Bunker was hit several times, but the bombs could not penetrate the thick roof, hence no damage was added to the bunker during this attack. The RAF had used 93 Halifaxes, 47 Lancaster bombers and 12 mosquito's in this raid, and lost only one bomber. 1260 450 kg bombs and 172 225 kg bombs was dropped within 11 minutes. The raid had been a partial failure. RAF would later try a second bomb raid on the 29. october 1944, with 244 planes. Due to dense clouds, only 47 dropped their bombs, killing a total of 52 civilians and no Germans. No damage was inflicted to the u-boat bunker. 3 planes was shot down. The second raid had been a failure. was partially blown up by the british after the war. It is now restored, and used by the Norwegian Navy. * The third bomb raid was on the 12. january 1945. This time with 33 Lancaster loaded with tallboy bombs, weighing about 5000 kg. (10 000 lb.) . The accuracy of the bombing had improved, and three tallboys found their primary targets, and struck the bunker. The German minesweeper M1 under attack. One penetrated the roof, causing a 8 meter wide crater on the top and a 4 meter crater inside! Little damage was caused though, 20 Germans where killed, 2 u-boats was lightly damaged. In the harbor the minesweeper M1 was steaming towards Helleneset (Away from Bergen), trying to avoid the Lancaster's, that had orders to find secondary targets like boats etc., if they was not able to ensure a hit on the Bunker. One Lancaster decided to go for the minesweeper, and managed to hit the boat. It is probably the only time a minesweeper was hit by a tallboy! 20 of the crew on 34 was immediately killed. The RAF lost four planes. Who was to blame for these tragic accidents? Many meant that the Germans wanted civilians to live near the bunker to avoid bombing, and a nearby school was to further ensure that bomb raids from the allies was avoided. The Germans claimed that they had tried to persuade the local government to hand over the school for military use, and that this was not successful. Anyway, the RAAF should not have chosen to bomb the U-boat base at a time when there was kids at the nearby school. They was fully aware that the school was used for civil purposes, and seemed total confident that none of the 1422 bombs would hit the school. It is easy to judge this action afterwards, but someone in the RAAF back then, must have known that the school was very likely to be hit. This loss must have been calculated up against the damage potential a fleet of u-boat from this base would have caused. The conclusion from the RAAF was, to bomb the bunker at any cost. The allies never managed to destroy the bunker during the war. 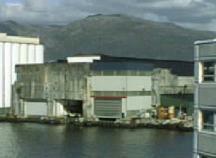 Today the bunker is used by the Norwegian navy to maintain and repair u-boats.